Handel's Rinaldo was his first opera for London, a chance to show London audiences what real Italian opera was and for the young George Frideric Handel to demonstrate his talents. Quite what he thought of the libretto is not recorded, but having set Cardinal Vincenzo Grimani's libretto for Agrippina in 1709-10 (one of the finest librettos that Handel would set), Aaron Hill's 'Boys Own Story' re-working of the story of Rinaldo and Armida must have seemed rather primitive. But it gave Handel a chance to show off, and this he did, re-working some of the finest music from his Italian sojourn with a preponderance of orchestral showpieces in addition to dazzling arias. 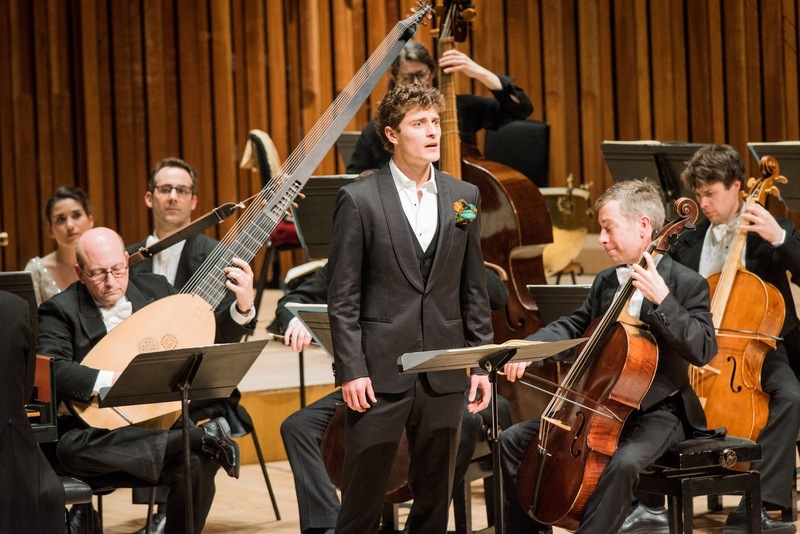 So it is no wonder that Rinaldo was chosen by The English Concert and Harry Bicket for their ongoing Handel series at the Barbican (13 March 2018). Iestyn Davies sang Rinaldo, with Jane Archibald as Armida, Joelle Harvey as Almirena, Sasha Cooke as Goffredo, Luca Pisaroni as Argante, Jakub Jozef Orlinski as Eustazio and Owen Willetts as Araldo and Mago. Whilst most of the cast used scores (albeit minimally), this was very much not a stand and sing performance, there was plenty of interaction between the characters as well as entrances and exits, which helped bring the drama out. The stage experience of some of the cast in their roles was very noticeable and gave us some vivid theatrical moments. 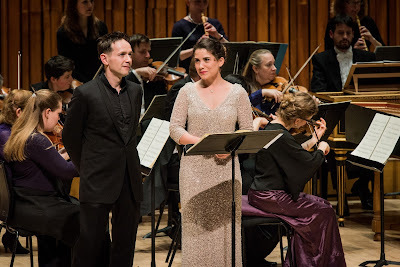 Iestyn Davies sang the title role at Glyndebourne in 2014 [see my review]. Whilst his showpiece aria 'Venti, turbini, prestate' which closes Act One, was dazzling Davies approach was refreshingly anti-heroic, this Rinaldo was easily distracted and had to be constantly reminded of his duty by Sasha Cooke's sober Goffredo. So we had a delightful duet with Joelle Harvey's Almirena in Act One, and the remarkable duet with Jane Archibald's Armida in Act Two with the two knocking sparks off each other, and of course the spectacular final aria with its quartet of trumpets. But for much of the time, Rinaldo was pensive and lovelorn, beautifully captured in 'Cara sposa' and 'Cor ingrato'. Davies has a strong stage personality and this imbued only his arias but his whole performance, lifting the drama above a simple. Armida is the first of Handel's fascinating bad-girl sorceresses, though Armida does repent in the end (Medea in Teseo, written two years later in 1713. does no such thing). She starts by snorting fire, a terrific performance from Jane Archibald, but in Act Two she falls for Rinaldo and Archibald really brought out the more intimate side of the character particularly at the end, in a terrific aria which mixed lament and rage, following Rinaldo's spurning of her. Archibald brought wonderful bravura to Armida's arias, a secure technique and a nice sense of character. If I have a niggle it is that Archibald's ornaments pushed the vocal lines into the stratosphere. Argante's first entry is almost pure pantomime, accompanied as he is by the hissing of snakes. Luca Pisaroni brought it off with magnificent elan, striding on and filling the auditorium with character. Perhaps the voice is not always ideally mobile, but Pisaroni sang everything with real bravura and the part was written for a bass, Giuseppe Maria Boschi, with a spectacular range. The more intimate moments were not neglected and 'Vieni o cara' was beautifully intimate. Once beyond her lively opening aria, the role of Almirena is to be passively lovely, whether in joy or sorrow. Joelle Harvey did this elegantly, giving, in particular, a spectacular 'Lascia io pianga' and the Act Three, 'Bel piacere e godere' with accompaniment mainly of violins in unison with the voice. But Harvey opened with a spirited rendering of 'Combatti da forte' and you rather wished the character had greater dramatic opportunities. The roles of Goffredo and Eustazio were expanded to give Handel's singers more to do, but neither character's arias are essential to the plot, this places added strain on the singers and both Sasha Cooke and Jakub Jozef Orlinski were impressive. Sasha Cooke gave a beautifully modulated and finely controlled performance, shaping her phrases and giving the character a thoughtful gravitas. Goffredo is the commander of the Christian forces and you felt a bit of martial vigour might have been in order, but Cooke impressed with sheer musicality. The role of Eustazio proved a welcome opportunity to hear the young Polish counter-tenor Jakub Jozef Orlinski. He has an attractive, brightly focused voice with a nice sense of style and engaging stage personality. His musicality made each of his arias well worth listening to. (We will be hearing more of him, he has just signed a contract with Erato and will debut a CD of baroque arias in the Autumn). 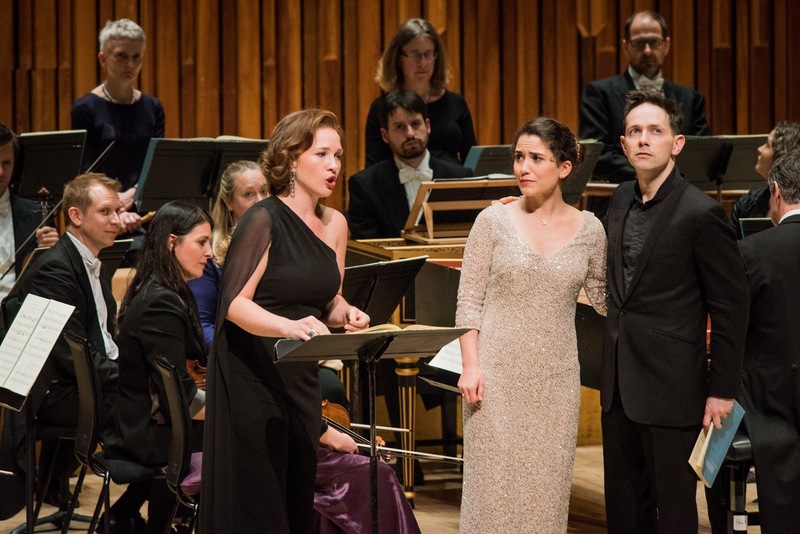 Counter-tenor Owen Willetts popped up as three different roles, Aroldo, Donna and Mago, bringing an element of bravura to his contributions and impressing in his Act Three aria. The opera is full of showpieces for the orchestra, from the trio of recorders in Almira's Act One aria, to the repeated use of trumpets and the spectacular harpsichord solo in Armida's final Act Two aria, not to mention the moments when Handel lets the bassoon off the leash, freeing it from the confines of the bass part. The musicians of The English Concert seized all these opportunities with bravura glee. Harry Bicket presided over everything with aplomb, drawing fine performances from his musicians. 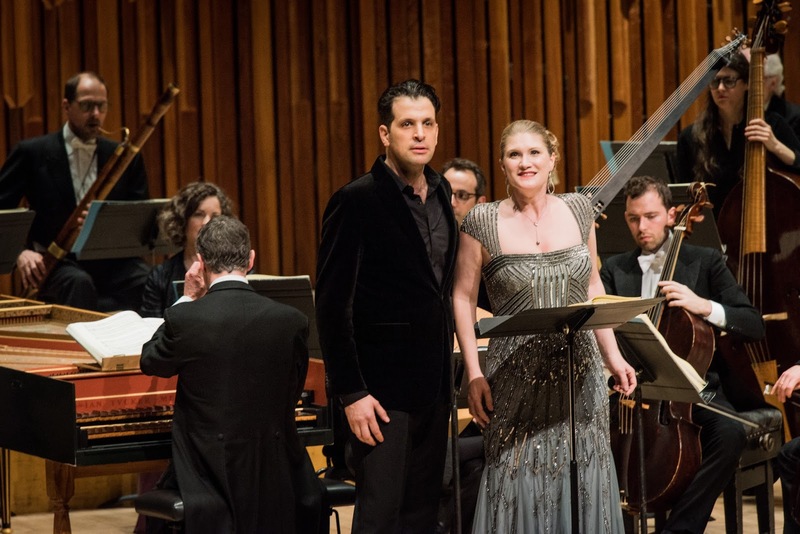 The Barbican Hall was full, with a queue for returns and the opera was performed in an admirably completed edition with two intervals starting at 6.30pm. A testament to how Handel's operas have grown in public affection. Next year, Semele. Handel's Rinaldo on disc: Rinaldo has been lucky in the catalogues, Jean-Claude Malgloire's recording on Sony is still recommendable and has interesting casting with Ileana Cotrubas as Almirena and Carolyn Watkinson as Rinaldo, whilst Rene Jacobs on Harmonia Mundi has Miah Persson as Almirena and Vivica Geneaux in the title role though I found Inga Kalna a bit light as Armida [see my review]. The starriest modern recording remains Christopher Hogwood's account for DECCA with David Daniels and Cecilia Bartoli as Rinaldo and Almirena, and a cast including Bernada Fink, Gerald Finley and Luba Organasova.